Linux adopters are organizations and individuals who have moved from other operating systems to Linux. Although Linux's status as a mainstream operating system is relatively recent, it is in use in many different environments, including government, education, home, business and scientific institutions. 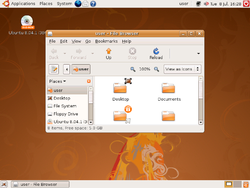 Ubuntu on desktop PCs in early 2008. As local governments come under pressure from institutions such as the World Trade Organization and the International Intellectual Property Alliance, some have turned to Linux and other Free Software as an affordable, legal alternative to both pirated software and expensive proprietary computer products from Microsoft, Apple and other commercial companies. The spread of Linux affords some leverage for these countries when companies from the developed world bid for government contracts (since a low-cost option exists), while furnishing an alternative path to development for countries like India and Pakistan that have many citizens skilled in computer applications but cannot afford technological investment at "First World" prices. In July 2001 the White House started moving their computers to a Linux platform based on Red Hat Linux and Apache HTTP Server. The installation was completed in February 2009. In October 2009 the White House servers adopted Drupal, an open source content management system software distribution. Brazil uses PC Conectado, a program utilizing Linux. City of Munich has chosen 2003 to migrate its 14,000 desktops to Debian-based LiMux, but until 2010 an adoption rate of only 20% was achieved. The United States Department of Defense uses Linux - "the U.S. Army is “the” single largest install base for Red Hat Linux" and the US Navy nuclear submarine fleet runs on Linux. The city of Vienna has chosen to start migrating its desktop PCs to Debian-based Wienux. However, the idea was largely abandoned, because the necessary software was incompatible with Linux. In April 2006, the US Federal Aviation Administration announced that it had completed a migration to Red Hat Enterprise Linux in one third of the scheduled time and saved 15 million dollars. The Government of Pakistan established a Technology Resource Mobilization Unit in 2002 to enable groups of professionals to exchange views and coordinate activities in their sectors and to educate users about free software alternatives. Linux is an option for poor countries which have little revenue for public investment; Pakistan is using open source software in public schools and colleges, and hopes to run all government services on Linux eventually. The French Parliament has switched to using Ubuntu on desktop PCs. The Federal Employment Office of Germany (Bundesagentur für Arbeit) has migrated 13,000 public workstations from Windows NT to OpenSuse. The German foreign ministry started migrating all of its 11,000 desktops to Linux and other open source applications, with the move to Linux servers in 2001 and desktops in 2005, with all laptops running Debian. In 2011 it was announced that the ministry will move back to Microsoft Windows, Microsoft Office and Outlook, citing "hardware support, interoperability and training and user adoption" as the reasons, although Microsoft incentives may have played a role. Cuba - Students from the Cuban University of Information Science launched its own distribution of Linux called Nova to promote the replace of Microsoft Windows on civilian and government computers, a project that is now supported by the Cuban Government. By early 2011 the Universidad de Ciencias Informáticas announced that they would migrate more than 8000 PCs to this new operating system. The Canton of Solothurn in Switzerland decided 2001 to migrate its computers to Linux, but in 2010 the Swiss authority has made a U-turn by deciding to use Windows 7 for desktop clients. France's national police force, the National Gendarmerie started moving their 90,000 desktops from Windows XP to Ubuntu in 2007 over concerns about the additional training costs of moving to Windows Vista. The migration should be completed by 2015. The force has saved about €50 million on software licensing between 2004 and 2008. France's Ministry of Agriculture uses Mandriva Linux. Macedonia's Ministry of Education and Science deployed more than 180,000 Ubuntu based classroom desktops, and has encouraged every student in the Republic of Macedonia to use Ubuntu computer workstations. The People's Republic of China exclusively uses Linux as the operating system for its Loongson processor family, with the aim of technology independence. 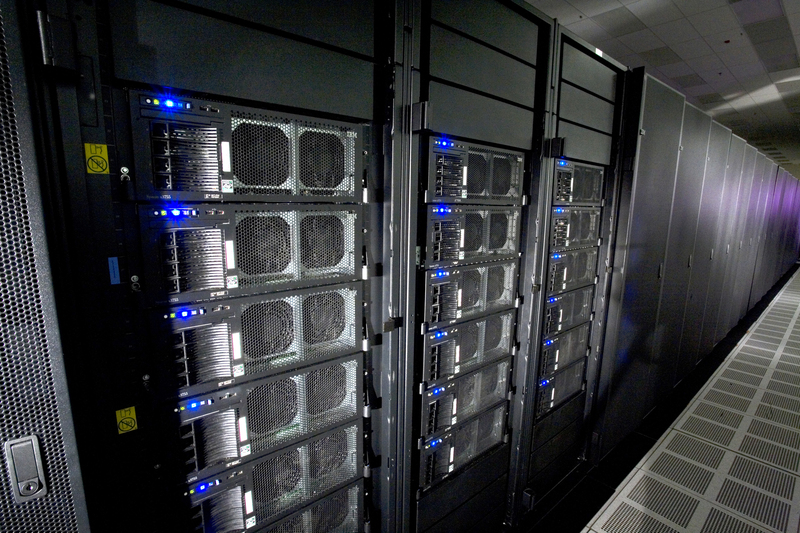 The US National Nuclear Security Administration operates the world's third fastest supercomputer, the IBM Roadrunner, which uses Red Hat Enterprise Linux along with Fedora as its operating systems. The regional Andalusian Autonomous Government of Andalucía in Spain developed its own Linux distribution, called Guadalinex in 2004. The South African Social Security Agency (SASSA) deployed Multi-station Linux Desktops to address budget and infrastructure constraints in 50 rural sites. In 2003, the Turkish government decided to create its own Linux distribution, Pardus, developed by UEKAE (National Research Institute of Electronics and Cryptology). The first version, Pardus 1.0, was officially announced in 27 December 2005. In 2010 The Philippines fielded an Ubuntu-powered national voting system. In late 2010 Vladimir Putin signed a plan to move the Russian Federation government towards free software including Linux in the second quarter of 2012. The city government of Largo, Florida, USA uses Linux and has won international recognition for their implementation, indicating that it provides "extensive savings over more traditional alternatives in city-wide applications." Linux is often used in technical disciplines at universities and research centres. This is due to several factors, including that Linux is available free of charge and includes a large body of free/open source software. To some extent, technical competence of computer science and software engineering academics is also a contributor, as is stability, maintainability, and upgradability. IBM ran an advertising campaign entitled "Linux is Education" featuring a young boy who was supposed to be "Linux". The OLPC XO-1 (previously called the MIT $100 laptop and The Children's Machine), is an inexpensive laptop running Linux, which will be distributed to millions of children as part of the One Laptop Per Child project, especially in developing countries. Republic of Macedonia deployed 5,000 Linux desktops running Ubuntu across all 468 public schools and 182 computer labs (December 2005). Later in 2007, another 180,000 Ubuntu thin client computers were deployed. Schools in Bolzano, Italy, with a student population of 16,000, switched to a custom distribution of Linux, (FUSS Soledad GNU/Linux), in September 2005. Brazil has around 20,000 Linux desktops running in elementary and secondary public schools. 22,000 students in the US state of Indiana had access to Linux Workstations at their high schools in 2006. Germany has announced that 560,000 students in 33 universities will migrate to Linux. The Philippines has deployed 13,000 desktops running on Fedora, the first 10,000 where delivered in December 2007 by ASI. Another 10,000 desktops of Edubuntu and Kubuntu are planned. Russia announced in October 2007 that all its school computers will run on Linux. This is to avoid cost of licensing currently unlicensed software. 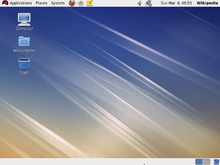 In 2004 Georgia began running all its school computers and LTSP thin clients on Linux, mainly using Kubuntu, Ubuntu and stripped Fedora-based distros. The Indian government's tablet computer initiative for student use employs Linux as the operating system as part of its drive to produce a tablet PC for under 1,500 rupees (US$35). Sony's PlayStation 3 came with a hard disk (20GB, 60GB or 80GB) and was specially designed to allow easy installation of Linux on the system. However, Linux was prevented from accessing certain functions of the PlayStation such as 3D graphics. Sony also released a Linux kit for its PlayStation 2 console (see Linux for PlayStation 2). PlayStation hardware running Linux has been occasionally used in small scale distributed computing experiments, due to the ease of installation and the relatively low price of a PS3 compared to other hardware choices offering similar performance. As of April 1, 2010, Sony disabled the ability to install Linux "due to security concerns" starting with firmware version 3.21. In 2008 many netbook models were shipped with Linux installed, usually with a lightweight distribution, such as Xandros or Linpus, to reduce resource consumption on their limited resources. Through 2007 and 2008 Linux distributions with an emphasis on ease of use such as Ubuntu became increasingly popular as home desktop operating systems, with some OEMs, such as Dell, offering models with Ubuntu or other Linux distributions on desktop systems. a licencing dispute with Microsoft. Linux is also used in some corporate environments as the desktop platform for its employees, with commercially available solutions including Red Hat Enterprise Linux, SUSE Linux Enterprise Desktop, and Linspire. Burlington Coat Factory has used Linux exclusively since 1999. Ernie Ball, known for its famous Super Slinky guitar strings, has used Linux as its desktop operating system since 2000. Novell is undergoing a migration from Windows to Linux. Of its 5500 employees, 50% were successfully migrated as of April 2006. This was expected to rise to 80% by November. Wotif, the Australian hotel booking website, migrated from Windows to Linux servers to keep up with the growth of its business. Union Bank of California announced in January 2007 that it would standardize its IT infrastructure on Red Hat Enterprise Linux in order to lower costs. Peugeot, the European car maker, announced plans to deploy up to 20,000 copies of Novell's Linux desktop, SUSE Linux Enterprise Desktop, and 2,500 copies of SUSE Linux Enterprise Server, in 2007. Mindbridge, a software company, announced in September 2007 that it had migrated a large number of Windows servers onto a smaller number of Linux servers and a few BSD servers. It claims to have saved "bunches of money." Virgin America, the low cost U.S. airline, uses Linux to power its in-flight entertainment system, RED. Amazon.com, the US based mail-order retailer, uses Linux "in nearly every corner of its business". Google uses a version of Ubuntu internally nicknamed Goobuntu. IBM does extensive development work for Linux and also uses it on desktops and servers internally. The company also created a TV advertising campaign: IBM supports Linux 100%. DreamWorks Animation adopted the use of Linux since 2001, and uses more than 1,000 Linux desktops and more than 3,000 Linux servers. The Chi-X pan-European equity exchange runs its MarketPrizm trading platform software on Linux. The New York Stock Exchange uses Linux to run its trading applications. American electronic music composer Kim Cascone migrated from Apple Mac to Ubuntu for his music studio, performance use and administration in 2009. McDonald's uses the Ubuntu operating system at McCafes. Laughing Boy Records under the direction of owner Geoff Beasley switched from doing audio recording on Windows to Linux in 2004 as a result of Windows spyware problems. Nav Canada's new Internet Flight Planning System for roll-out in 2011, is written in Python and runs on Red Hat Linux. Electrolux Frigidaire Infinity i-kitchen is a "smart appliance" refrigerator that uses a Linux operating system, running on an embedded 400 MHz Freescale i.MX25 processor with 128 MB of RAM and a 480×800 touch panel. Linux and Fedora as its operating systems. CERN uses Scientific Linux in all its work, including running the Large Hadron Collider and for its 20,000 internal servers. Canada's largest super computer, the IBM iDataPlex cluster computer at the University of Toronto uses Linux as its operating system. The Internet Archive uses hundreds of x86 servers to catalogue the internet, all of them running Linux. Tianhe-I, the worlds fastest super computer as of October 2010, located at the National Centre for Supercomputing in Tianjin, China runs Linux. FermiLab's Dark Energy Camera and associated 4m telescope, part of the The Dark Energy Survey will be controlled by and store all its data on computers running Linux. The University of Portsmouth in the United Kingdom has delpoyed a "cost effective" high performance computer that will be used to analyse data from telescopes around the world, run simulations and test the current theories about the universe. Its operating system is Scientific Linux. Dr David Bacon of the University of Portsmouth said: "Our Institute of Cosmology is in a great position to use this high performance computer to make real breakthroughs in understanding the universe, both by analysing the very latest astronomical observations, and by calculating the consequences of mind-boggling new theories...By selecting Dell’s industry-standard hardware and open source software we’re able to free up budget that would have normally been spent on costly licences and reinvest it." In September 2011 ten autonomous unmanned air vehicles were flown in flocking flight by the École Polytechnique Fédérale de Lausanne’s Laboratory of Intelligence Systems in Lausanne, Switzerland. The UAVs each sense each other and control their own flight in relation to each other, each has an independent processor running Linux to accomplish this.